Stevington secured a 3-1 home win over Queens Park Crescents thanks to a brace of goals from William Pinney and a single goal from Kieran Souter against a lone Crescents reply from Jamaine Ivy. Wilstead emerged 5-4 penalty shoot-out home winners over SSML side Langford after 90 minutes play had saw the clubs deadlocked at 1-1. Paul Jones was the Wilstead goalscorer. Shefford Town & Campton remain nine points clear in the Premier Division supported by Sportsform after they chalked up away win 10 on the bounce in winning 1-0 at AFC Kempston Town & Bedford College thanks to a goal from Kane Dougherty. Second place Cranfield United won 3-0 at Crawley Green Reserves to end the home side’s six game unbeaten home run. Courtney Boughton with a brace and a single goal from Justin Newman did the damage. Ickwell & Old Warden are third following their 6-1 home victory over Caldecote who have now lost their last seven games. Scott Alleyne scored five times and Connor Green once against a lone reply from Liam Beech. Missing out on the chance to occupy that third spot were AFC Oakley M&DH after they were beaten 2-1 at Riseley Sports. Josh Poole plus a penalty from Lewis Donald were only replied to once by M&DH’s Zach Ives. At Weston Park the rent for tenants Marston Shelton Rovers could well be on the increase after they netted a 3-2 home win over their landlords Wootton Blue Cross to take their unbeaten ways up to six games. Dale Malciw, Jordan Mongey and Nick Skolsky were on the Rovers scoresheet against Blue Cross replies via Anthony Wright and Lui Sarrington. There is no change at the head of Division One supported by O’Neills following wins for the top two sides. Leaders Bedford Albion thrashed AFC Kempston Town & Bedford College Reserves 9-1. Paul Babbington led the way with a hat-trick, Adam Lewis hit a brace and single goals came from Jesse Sidhu, Matt Phelan, Kegan Roberts and Dante Barlie. Second place Cranfield United Reserves took their unbeaten run to eight games with a 6-3 home victory over Wixams. Jordan Conway with a brace was joined on the home scoresheet by single goals from Liam Whitney-Craig, Joe Sames, Luke Gray and Callum Ritches against visiting replies via Gareth White twice and Adam Jellis. This loss by Wixams saw them drop to fourth and overtaken by Biggleswade FC Reserves who remain unbeaten on the road this season after winning 9-0 at Sandy who have now lost their last seven games. Adam Drakulic, John Veal and Ashley Boness all netted twice to go alongside single goals for Kian Mitchell, Cian Coles and George Riley. Fifth place Shefford Town & Campton Reserves were 4-0 home winners over Totternoe Reserves – Ryan Dobson with a brace plus single goals from Jack Dreyer and Cameron Sharp doing the damage. Lea Sports PSG took their unbeaten sequence to five games when an own goal took them to a 1-0 win at Flitwick Town Reserves. Cople & Bedford SA claimed their first away win, 2-1 at Henlow. Akeen Lender and Ollie Hughes goals only being replied to once by Luke Hills for the home side. Christians in Sport (Luton) make it into round three with a 3-1 home win over Beacon Church Camberley. Adam Oilver, Paul Jones and Chris Horncastle all found the back of the net. Houghton Athletic’s lead in Division Two supported by Hy-Pro is now down to just two points after they were held to a 0-0 home draw by Kempston Athletic. This was good news for Elstow Abbey who leapfrogged Kempston into second following their 4-3 victory at Meltis Albion to chalk up their sixth away win on the bounce. Having played two games fewer than the Athletic they are now the new favourites for the title. However the Abbey didn’t get all their own way at the Albion, finding themselves 3-0 down after half an hour following home goals from Asa Garlick, Aaran Wright and Sean Cavavan. They struck back with a brace from Jason Allison plus single goals from Daniel Jeffries and Glen Tumulty to win the day. The Albion drop to fifth, overtaken by Atletico Europa who shared the spoils in a 1-1 draw at M&DH Clapham Sports. Owen Franklin netted for the home side and Mo Banda did likewise for Europa. Whilst now in sixth are Sporting Lewsey Park who took their winning home run to five games with a 3-2 victory over Black Swan (Luton) Sean Fahy, Chris Gibson and Lee Mooney were on the Park scoresheet against a brace in reply from Swan’s Danny McGovern. For St Joseph (Saturday) it was away win number three on the bounce in winning 7-2 at AFC Oakley M&DH Reserves. Simon Richards led the way with a hat-trick, Glenn Marshall grabbing a brace and single goals coming via Darragh Dunbar and Patrick Daly against home replies via Brad Duffet and Jamie Endersby. Also enjoying life on the road were Sundon Park Rovers who returned to winning ways for the first time in six outings, 2-0 at Clifton who are without a win in their last six outings. Ben Pincher and Tay Roberts were the Rovers goalscorers. CS Rovers claimed their fourth home win on the bounce with a 4-1 victory over Caldecote Reserves. Joe Campion, Kieran Taylor, Jack Leech and Kevin Feldmann all found the back of the net against a lone reply from Nicky Thomas. Unite MK Reserves drew 2-2 at home against Luton Leagrave AFC. Brandon McConnell netted both goals against AFC replies from Aaron Mead and Jordan Copeland. The lone Division Three supported by Hy-Pro game of the day saw Wootton Village climb to eighth following their 3-1 home victory over Real Haynes Reserves. Aiden Medhurst netted twice and Harvey Eagle once against a lone reply from Matthew Turner. 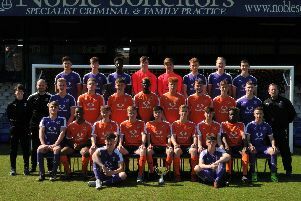 The biggest win of the day went to Pines (Luton) with a 10-2 away win at Bedfordshire Saturday Youth League side Sacred Heart U18 Lions. Ryan Smith led the way with a hat-trick, Kevin Snoxall with a brace plus single goals from Ben Harris, James McGuinness, Andy McMaster and Jimmy Gallagher only being replied to twice by Ashley Ingham for the home side. 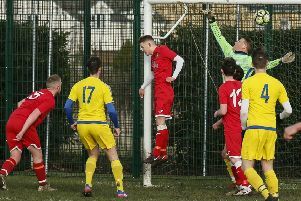 Pines will now face an away trip in round three to Thurleigh who won 3-1 at FC Polonia (Luton) thanks to goals from Kevin Harris, Jamie Evans and Ross McMillan against a lone home strike from Maciej Grad. Shefford Town & Campton A beat Dinamo Flitwick 5-0. Ben Sheehan and Kyle Cook with braces were joined on the Town scoresheet by Sam Lummis to bring up the nap hand and earn them a home game in round three against the winners of the yet to be played Square FC v Stevington Reserves tie. Harlington Juniors ,thanks to goals from Alex Frantellizzi, Jamie Small, Ben Chapham and Kevin Lambert, were 4-2 home victors over Flitwick Town A for whom Ian Bickingham netted twice. This earned them a home round three encounter with Bedford Albion Reserves who won 4-1 at Wixams Wanderers. Aaron Fletcher, Giuseppe Lamberti, Stefan Bucur and Hayden Shipp scored for Albion, Joe Seward-Clark netting for Wanderers. The final quarter-final tie will see Lidlington United Sports following their 5-4 home win over BYSL Ampthill Town U18 Albion now travel to Real Haynes who were granted a bye when BYSL Bromham Youth U18 withdrew. The United goals came from Jamie Rodd, who netted four, and Edward Janes against Town replies from Josh Maxted and Nathan O’Donnell.